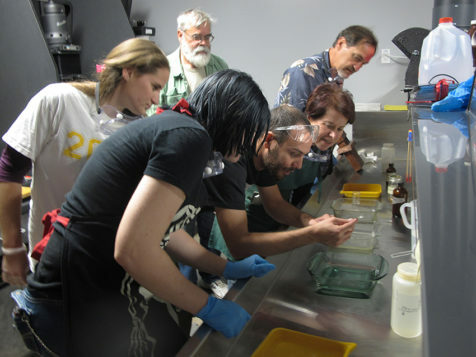 Discover the wonder of contemporary tintype in this hands-on workshop led by wet plate collodion artist David Emitt Adams. Learn this process from start to finish, including preparing your chemistry, coating and sensitizing your plate, creating successful exposures, and finishing and varnishing your plate. Experience the unforgettable opportunity to create unique images the way photographers have been doing since the 1850s. You will use a 4×5 view camera to capture your images, and all materials to create two tintypes are included in the workshop fee. Students will be given instruction on using Bostick and Sullivan’s tintype kit, taking some of the mystery out of creating tintypes on your own. Originally invented in 1851, this early photographic process involves pouring a collodion emulsion over an aluminum plate and exposing the sensitized plate before the coating dries. Its popularity was short-lived, and the process was largely discarded in favor of faster, easier methods. However, this beautiful process has experienced a revival in the 21st century: in an increasingly digital age, artists and enthusiasts are returning to the one-of-a-kind, handmade aesthetics of wet plate collodion tintypes. David Emitt Adams is an artist whose current practice engages historical photographic methods in order to create an informed contemporary dialogue about the past and present. Born in Yuma, Arizona, David obtained his Bachelors of Fine Art from Bowling Green State University and a Masters of Fine Art from Arizona State University. He is a recipient of the Clarence John Laughlin Award, the Puffin Foundation Grant and the Arizona Commission on the Arts Research and Development Grant. His work is in the permanent collection of The Center for Creative Photography, The Santa Barbara Museum of Art, Museum of Photographic Arts San Diego, The George Eastman Museum and numerous private collections. He has exhibited nationally and internationally including museum exhibitions at Wichita Art Museum, Santa Barbara Museum of Art, Phoenix Art Museum, Roswell Museum and Art Center and the Tucson Art Museum. In 2018, David will be exhibiting at the Ogden Museum in New Orleans and the Southern Utah Museum of Art in Cedar City.